On Saturday, August 1, KCTL students participated in a special intraleague tournament, Davis Cup, at Marcy Playground. The first site-wide contest of 2015, Davis Cup marked the season's halfway point, making it the right time to apply eight weeks of tennis lessons in combination. The doubles-style tournament is also a low-pressure precursor to the Jamboree, a higher-priority singles competition at the season's conclusion. Competition aside, Davis Cup was an opportunity for KCTL students, parents, and family members to meet their peers from other sites. We had strong attendance on all fronts, including many spectators seated comfortably--and, occasionally, jumping up and down enthusiastically--along the sidelines. Aided by a colorful world map, volunteers and staff from each site presented brief lessons on their countries. The students were encouraged to contribute their own research findings and knowledge to the conversation. Newly enlightened by geographical and historical facts, the students took to eight mini tennis courts for double matches with their international opponents. The first pair to reach 12 points was declared the winner of the match. But the losing team's effort did not go to waste; their points contributed to their country's total score. So, for example, if Jamaica defeated Egypt 12 to 8, Egypt's 8 points were included in Egypt's final count. At the end of the tournament, all points were tallied to determine the Davis Cup's winning country. After several rounds of close matches filled with vigorous effort, sharp groundstrokes, and good sportsmanship, we gathered for the announcement of the winning team. Ultimately, Marcy (Italy) was named victorious in the 2015 Davis Cup, but, quite impressively, Jackie Robinson (Trinidad and Tobago)--KCTL's newest team--came in second by only five points. We're proud of all players for their dedication, for keeping their cool on the court, and for having fun. Winning students earned pins, new grips, and the right to brag until the Jamboree! We're commemorating another inspirational season of youth mentoring through tennis. View our favorite moments from 2014 in the slideshow below. Can you believe we're headed towards the end of the season already? July and August have just flown by! This past Saturday, things went back to our regularly scheduled programming after an amazing intra-league Davis Cup tournament last week. Marcy played a lot of games and match play, and broke into serves. Lafayette Gardens had a 2:1 student to volunteer ratio, as did Sumner. A perfect opportunity for the volunteers to work with the students on the fundamentals. Tompkins Houses had Family Day, so there wasn't too much tennis happening there. Overall a really nice day. This coming Saturday, we have one of our big events of the season: Arthur Ashe Kids Day. AAKD is an opportunity for parents and kids to experience tennis together on the main stage. Kids will go on the courts to play with the pros and participate in fun games. They will also get to watch the top pros practice. Buses leave at 9:00AM, we get back at 4:30PM. P.S. Thank you to everyone who support KCTL during our annual fundraiser. It was a spectacular evening and we hope to have photos soon! Reminder to parents and players: KCTL will be holding it's second intraleague Davis Cup of the season this Saturday, August 10! Meet at your site at 1pm and your site leader will walk everyone over to Marcy Playground. The Davis Cup is a men's tennis tournament where players compete for their country (similar to the Olympics.) The women's tennis tournament is called the Federation (Fed) Cup. Read about our first Davis Cup held earlier this season: ‘Global’ Tennis Tournament Teaches Bed-Stuy Kids Backhands and Borders and view photos from it on Facebook. KCTL in the Press & No Class on Saturday, July 6th! Reminder no class this Saturday due to the July 4th holiday! DNAinfo.com covered our Davis Cup event last Saturday! Read the article, 'Global' Tennis Tournament Teaches Bed-Stuy Kids Backhands and Borders. "Kids from The Marcy, Tompkins, Sumner and Lafayette Gardens houses broke into teams representing Russia, Japan, France and Spain and hit the courts, learning facts about their respective countries along the way. "We try to use tennis as a way to get kids out there - get the kids active, get the kids thinking," said league founder Michael McCasland. "Tennis is the instrument to teach life skills." Last Saturday, we had a very special class as we put on our first ever, intraleague Davis Cup. All four teams gathered at Marcy site to play in a global competition. We let all the kids warm up and then had a brief introduction explaining what the Davis Cup is (a global competition where tennis players play as teams for their country to score points and win the tournament.) We pulled out a map to show the kids the different countries we had chosen for the site. Marcy and Lafayette Gardens were Japan and Russia, and Tompkins and Sumner were France and Spain. We broke the kids up into different age brackets: 10 and over, 9 and under. Marcy played the defender since they were hosting the event at "their house" and didn't compete for points. The other teams took turns getting on to the court as the challenger in King-of-the-Court style play. France took home the win for the 10 and over bracket and Russia took home the win for 9 and under kids. It's always a great day when we bring all the kids together and watch them compete and have fun playing tennis, so really, everyone was a winner on Saturday. We're hoping to have another intraleague game day this season in August. We think these in-class events prepare the kids for the end-of-season tournament, the ups and downs of winning and losing, and the need for perseverance and practice. View more photos of our special KCTL Davis Cup on the KCTL Facebook page! (Don't forget to "Like" us, while you're there.) Huge thanks to Sam Hasan for the photos! Don't Forget: KCTL Davis Cup tomorrow! Last Saturday was so much fun. We worked on forehands and backhands, progressing towards rallying in preparation for this week's Davis Cup competition between all four sites. Lafayette Gardens came out in full force, with 6 volunteers and 20 students. Marcy even started working on serves! 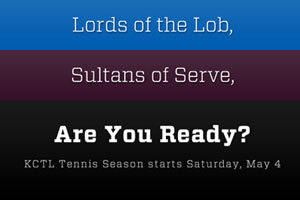 This coming Saturday, we'll be holding an intra-league Davis Cup at Marcy site! Stop by and see how the kids are progressing! I can't believe it's already here, but KCTL's 4th Seasons kicks off on Saturday, May 4, 2013 at all four locations: Marcy, Tompkins, Lafayette Gardens and Sumner Houses. We'll be keeping an eye on the weather all week, but so far the forecast is sunny and mid 60s. A perfect day for tennis. Students: If you haven't registered yet, sign-up with your Resident Association office ASAP. Volunteers: Meet at your respective sites at 12:30pm. If you're new or are unsure about which site to report to, head over to Marcy site (at Marcy Playground) and we'll get you to the right place. Learn a bit about our awesome site leaders on the individual team pages: Maayan at Marcy, Bobby at Tompkins, Duayne at Lafayette Gardens and Dimitri at Sumner. Check out a photo from Saturday's Volunteer Training: Part II. View more photos from training on the KCTL Facebook page.